We got an advanced look at the upcoming indie film ‘American Animals’ starring Evan Peters, Blake Jenner, Barry Keoghan and Ann Dowd. Check out our review of the film below and be sure to check it out in theaters – it’s definitely one you don’t want to miss! Centering on unpredictable wild child Warren (Evan Peters) and aspiring artist Spencer (Barry Keoghan), two friends from the middle-class suburbs of Lexington, Kentucky, the film follows the duo through college life at separate universities, as adult pressures begin to weigh heavily on their futures. Realizing their lives may never be important, they organize the brazen theft of some valuable books from the special collections library of Spencer’s college, including Audubon’s Birds of America, valued at $10 million. Enlisting two more friends, budding accountant Eric (Jared Abrahamson) and fitness fanatic Chas (Blake Jenner), the gang meticulously plots the theft and subsequent fence of the stolen volumes, taking cues from popular heist movies. But the thieves’ plans go awry, placing their bright futures in limbo. American Animals is a heist film like you’ve never seen. It’s a heist film of epic proportions. Brilliant performances, unique cinematography and storytelling in a way that’s never been done before all make up this groundbreaking film that is not to be missed! 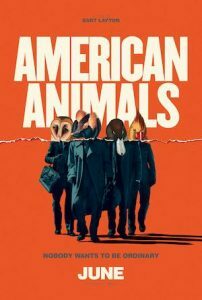 American Animals is the telling of a true story, but unlike most films based on a true story, this film aims to recount the series of events with as much accuracy as possible in a variety of measures. The real life subjects were involved and intermittently pop in to give a recount of the events. They don’t shy away from showing that it’s hard to know in some moments exactly what happened. They show conflicting recounts of the events. They show doubt from one friend to another if he even did what he said he did. The filmmakers laid it all out on the table. I really appreciated how the filmmakers handled the topic of this film. It would’ve been very easy to take this robbery gone wrong and villianize the four men and victimize the librarian who got hurt. And sure there’s some truth here, but truth is rarely black and white. The film looks at each of the men and what led them to their decision to rob the library. It looks at the aftermath and how their lives were impacted. And not just in the obvious way (ending up in prison) but also that moment between when they had completed the heist and when they got caught. Though one might have expected them to feel on top of the world in accomplishment, the reality is it led to feelings of regret, despair and being lost. Even though the average young adult would never contemplate something as monumental as stealing millions of dollars worth of property, I think audiences will be surprised at how much they can relate to each of the young men in their desires for something more in life than the mediocrity they felt trapped in. I must give some shout outs here to the actors. It was perfect casting, and each one completely embodied the real life person they were playing. Seeing the parallels between actor and real life person throughout the film easily could’ve negated this, but because the acting was so superb, it only highlighted how great each actor was in their performance. After seeing Evan Peters as Warren, I can’t imagine anyone else playing him. I also especially loved the cinematography in the film. The beginning of the film has a sequence of shots that are upside down and that instantly sets the tone of the chaos to come. Other shots add to the performances of the actors and heightens the emotional turmoil and confliction they went through. I highly recommend checking out American Animals. It’s a thrilling ride from start to finish and I guarantee you’ve never seen a heist film like this before! 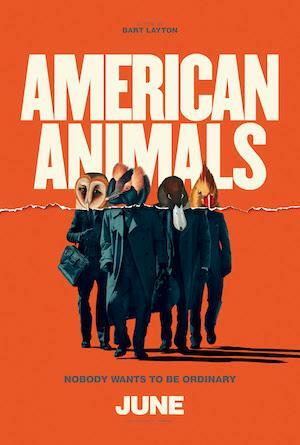 American Animals releases to select theaters June 1st. Please go support this superb indie film so it can go to more cities!